When the U.S. House of Representatives debates the Conservation and Economic Growth Act (H.R. 2578) next week, among the issues for consideration is legislation to streamline the lethal removal of sea lions from the Bonneville Dam. Tucked into the omnibus bill is Title VII, the Endangered Salmon and Fisheries Predation Prevention Act, introduced in 2011 by Congressman Doc Hastings (R-Wash). If passed, H.R. 2578 will roll back existing federal protections for California sea lions, who have long been scapegoated on the Columbia River as predators of endangered salmon. Since 2008, the federal government has authorized the states of Oregon and Washington to use lethal means to remove California sea lions from the Bonneville Dam. To date, at least 39 sea lions have been lethally injected and 11 taken into captivity. Sharon Young, marine issues field director for the Humane Society of the United States, (HSUS) is concerned that the proposed legislation would allow such decisions to be made with little or no public scrutiny. Said Young, "It would sacrifice public involvement and transparency in the name of speed." 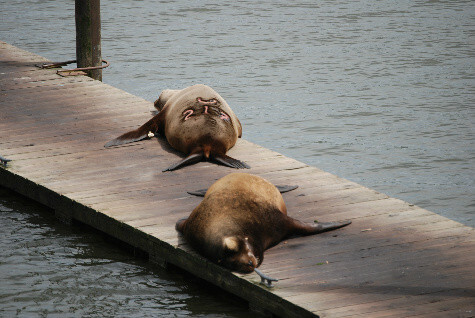 HSUS contends that while sea lions do eat salmon, their impact pales in comparison to that of fishermen and the Bonneville Dam. Commercial, recreational and tribal fisheries are allowed to kill up to 17 percent of the endangered salmon on the Columbia River. Sea lions have eaten less than 2 percent of these fish over the last four years. "This bill seeks to exempt a lethal wildlife management program from any compliance with environmental laws and would instead allow sea lions to be killed for eating fish of any species in the Columbia River," said Young. Activists with the social media campaign Save Misty the Dolphin are calling H.R. 2578 a "death sentence" for sea lions at the Bonneville Dam. The group is urging U.S. Citizens to contact their Members of Congress and tell them to "kill the bill not the sea lions."